Be a responsible gun owner! The first crucial step is knowing what is legal so you stay on the right side of the law. The anti-gun movement has made gun law dangerously complicated for law-abiding citizens! Don't stop carrying and let them win, arm yourself with knowledge. "Well, I didn't know that was illegal," is not a good legal defense! Law-abiding gun owners get caught up in the legal system every day because they don’t know the law. Ignorance of the law is not an excuse! What to expect at a Gun Law Seminar? Real life experiences! Hear from Attorneys that have defended law-abiding gun owners through legal nightmares. Separate legal fact from fiction! Real-life encounters with law enforcement can have real-life penalties. Hear from veteran law enforcement officers as they explain how to protect your rights during a police encounter. 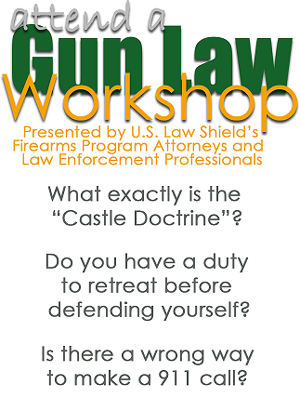 Get answers to the questions that have kept you from exercising your right to defend yourself! Use of Force Booklet ($9.95 value). Simple to read with graphics and diagrams, this is a straight to the point booklet on when you can defend yourself legally that every gun owner needs in their library. A Special Membership offer from U.S. Law Shield. Once per quarter. Don't miss the next one!